Find Your Gardening Plants Zone? 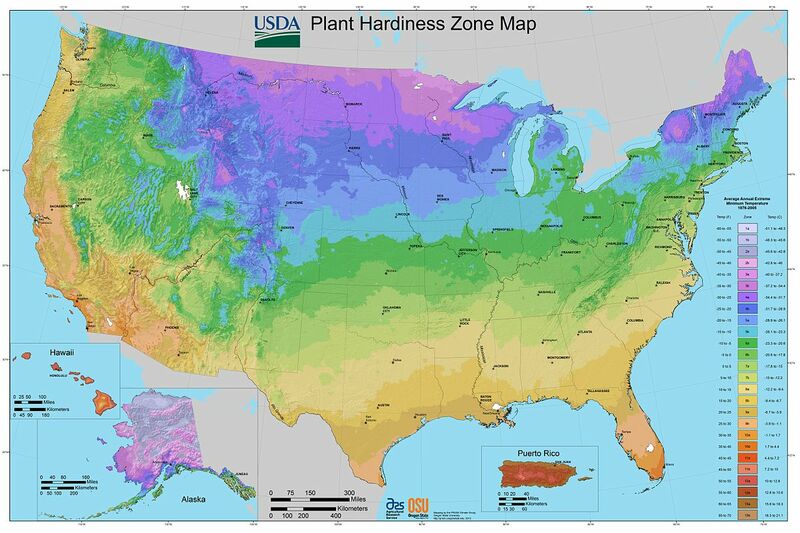 Since the US Department of Agriculture issued its first USDA Plant Hardiness zone map in 1960, it has been the standard for gardeners, landscapers, and plant nurseries. Set with 10 degree increments, plant life hardiness zone designation provides the minimum and maximum temperatures it can often withstand. Some plants maybe hardy enough to grow and thrive 1 zone above or below their USDA gardening zones designation. It will depend on the plant and where it would be growing. While the USDA Growing Zone Map was created originally for this country, it has been adopted by Canada and other parts of the world. The most current map available was updated in 2012 (as seen below). The continental United States encompasses planting zones 2 to 11. An example of how to interpret the zones are to visit the Barberry Shrub page. Clicking onto the Plant Details tab you will see Planting Zones: 4, 5, 6, 7, 8, 9. This means that this flowering shrub will grow from approximately St. Paul, MN to Tampa, FL. To find your gardening zone, enter your zip code into the red box at the top of the page. With a click, it will reveal your Planting Zone.